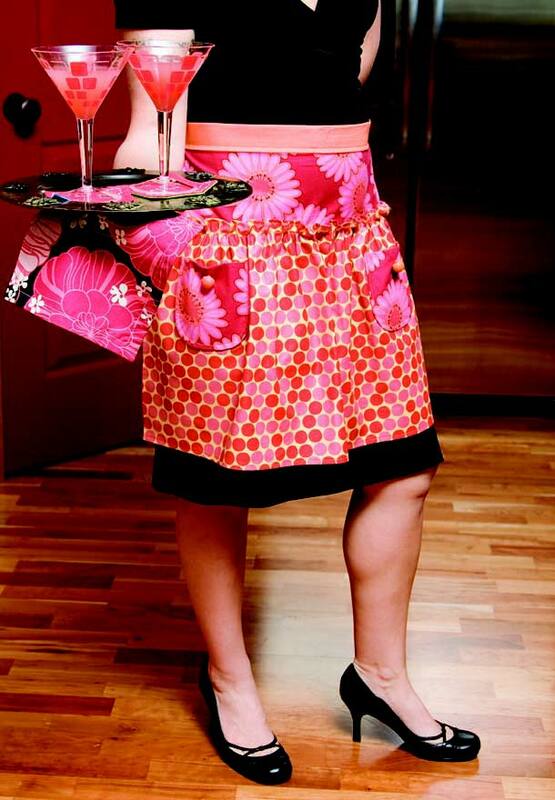 Aprons are all the rage right now, so why not make your own? They're a great, stylish way to protect your clothes from getting stained in the kitchen, and they make really nice, affordable gifts for birthdays, Mother's Day, Christmas, etc. 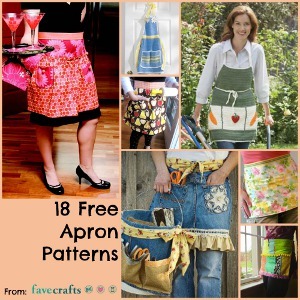 Use these free sewing craft patterns to make and embellish aprons for all skill levels. Sewn Halloween Apron: Using this free sewing pattern, some ribbon, and fabric you can have this cute sewn Halloween apron to use in your kitchen. How to Sew a Lined Apron: Follow this sewing tutorial to create an easy, lined half-apron featuring a contrast lining, a handy pocket, gathering and a waistband. Sassy Apron: Sew up a sassy apron for the kitchen with this free apron sewing tutorial. A ruffle and pockets in coordinating fabrics are cute finishing touches. Easy Apron to Sew: Here's a simple apron sewing pattern that anyone can do! All you need is a pillow case! 4th of July Apron: Embellish a plain apron with a patriotic cross-stitch design to protect your clothes and declare your American pride using this free sewing pattern. Delicious Cupcake Apron: Use a sewing tutorial that teaches you to not only sew an apron, but also to decorate it with delicious cupcakes! Easy Apron for Mom:This sewing craft project is great for a Mother's day gift or for any holiday. Personalize an apron for mom with an easy doily pocket with floral accents. Bonjour Paris Apron: You may not wake up in Paris, but you can get a taste of Parsian life with this Bonjour Apron. It's easy to make and makes a great gift for someone who loves making breakfast! 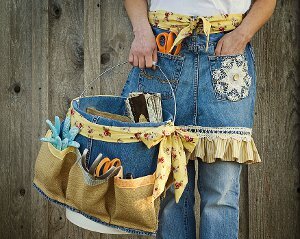 Denim Apron for Mom: Great for women who love gardening, crafting, and organizing, this apron is eco-friendly and easy to make. Quick Pillowcase Apron: If you have a spare ten minutes and a pillowcase, you can create a pretty half-apron for the kitchen. Just follow this sewing tutorial. Crafty Coffee Bag Apron: Make an apron out of a recycled coffee bag with this easy sewing pattern for green crafting. Reversible Scrap Fabric Apron: Here's another environmentally friendly apron pattern. This one's made from old scraps of fabric and bits of trimming. Quick and Easy Half Apron:This simple apron sewing project is great for beginners and makes a great gift. Dishtowel Apron: Grab 2 dishtowels and whip up this easy apron in no time! This is a great way to use towels that don't match your decor scheme, and it makes one easy dollar store craft! Daisy Apron: Crochet a cheerful apron in blue and yellow with daisy accents. Place crochet daisies wherever you like on the apron, making one, two or a whole garden full! Gardening Apron: Crochet a fun and functional apron for gardening with fruits and vegetables on the three pockets. This gardening apron crochet pattern is easy to create and comfortable. Snowflake Hostess Apron: Bring the Christmas spirit to the kitchen with a Snowflake Hostess Apron. Whether you're the cook in the house, or you'd like to make this Christmas crochet pattern for someone you love, it'll be perfect. Granny Square Apron: Let your little girl help you in the kitchen by making her this adorable granny square apron! Using this crochet apron pattern, you can crochet squares and turn them into a delicate, flower embellished apron for an aspiring chef.